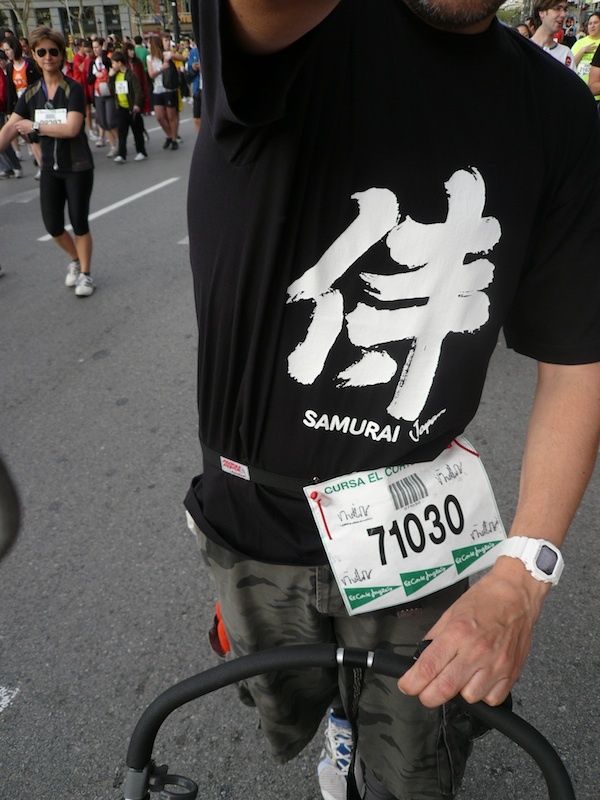 In Barcelona, every year we celebrate one of the biggest run on earth, with almost 60k runners this year this is more than 2 times Tokyo’s marathon. So Miffa and me got into our Samurai outfits and we run it in the baby stroller category with great success. RABIDAS Hong Kong a leader in athletic apparel and bunny sensation Miffa Chan has signed a two years contract. 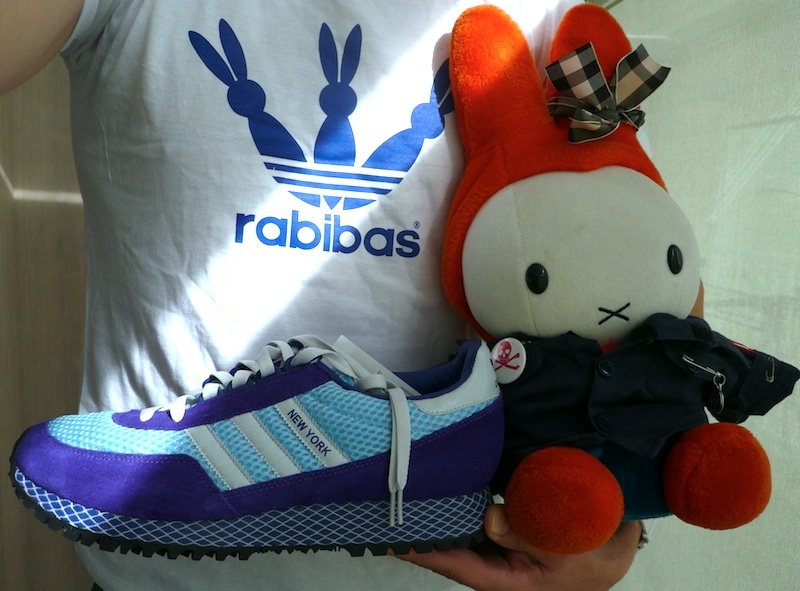 The winner of 2009 Barcelona and 2010 Tokyo Marathon in Bunnies categorie will use RABIDAS products in all her training and competitions. The agreement has been made possible thanks to 9j’s SPORT MANAGEMENT. RABIDAS Hong Kong, líder en material deportivo y la super estrella coneja Miffa Chan han firmado un contrato que une a ambas partes por dos años. La ganadora de la maratón de Barcelona de 2009 y de Tokyo de 2010 en la categoría de lepóridos usara los productos RABIDAS en sus entrenamientos y competiciones. Under terrible weather with low temperatures and pouring rain we suceeded. We suffer much more than in Barcelona and this time we really deserved the medal. Our friends from Cafemiffy were there too to help us in the logistics and to give us support, our succes is a result of their help and dedication. Obviously to help Father Bunny to finish the course like in Barcelona. Last time problems with several issues have ruined our excellent training but we are confident to achieve a nice result in this course. 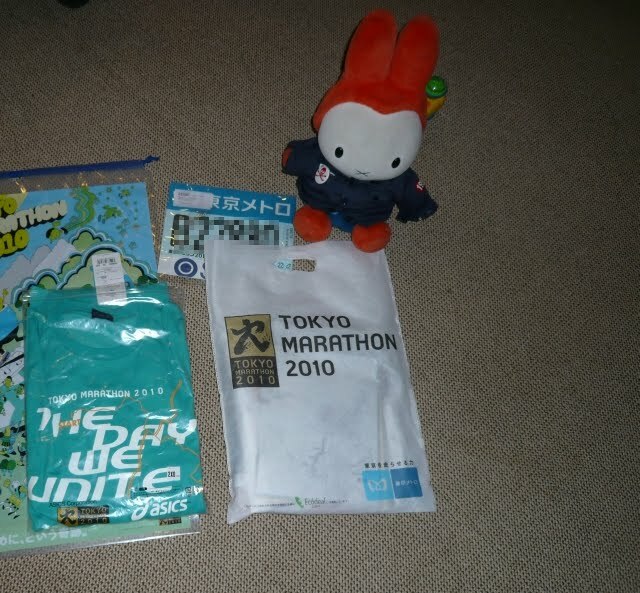 The Marathon Expo was incredible, the way to find the right place, quite hard, but after reading the start point procedures and rules I think that we will run two marathons. The first to find our way to the place and our starting lot and then – easier- to run the 42.195 kms. Mientras que en Barcelona los miembros de mi equipo estaban ultimando los últimos detalles para correr la cursa de bombers del 2009 yo me estaba acabando de levantar para correr mi primera carrera de trail de mi vida: La Volvo Bonaqua Mui Wo a Pui O sprint run en la isla de Lantau (Hong Kong). La verdad es que tenía bastantes esperanzas de hacerlo bien ya que en nuestro entrenamiento abundan los desniveles y las zonas de tierra. El día anterior – maldito jet lag- me pase hasta las tantas dibujando el mapa de la carrera en el Google Earth para ver el desnivel. Lo hice hasta el kilómetro 8 (cuando me cansé) y me descargue un par de ficheros con datos DEM (Digital Elevation Model) que me sirvieron para poder calcular el perfil aproximado de la carrera. También me dio para investigar un poco quien participa y quien esta delante, y es que si un tío con 1:08:00 en media maratón queda en el décimo puesto, hay que pensar que algo huele mal. Desde luego he cometido un montón de errores, el primero no llevar agua ni isotónica para los primeros 8 kilómetros (check point y avituallamiento). Correr en un bosque tropical o sub tropical (no voy a discutirlo) con 26 a 29 grados y casi un 98 % de humedad no es algo que encontremos a estas alturas en el Parc Güel. Otro error fue empezar la carrera a un ritmo moderado, unos 3:40 el kilómetro que me dejaron en medio del pelotón el primer kilómetro. ¿Qué cojones pasa aquí? Me preguntaba. Y pronto me respondieron, acabado el primer kilómetro el camino se hacia tan estrecho que en algunas zonas no se podía ir más que en fila india. Desde el 1.6 al 2.5 el camino era de subida, una subida bestial, pero fui capaz de hacerlo corriendo, a un ritmo modesto, pero corriendo. 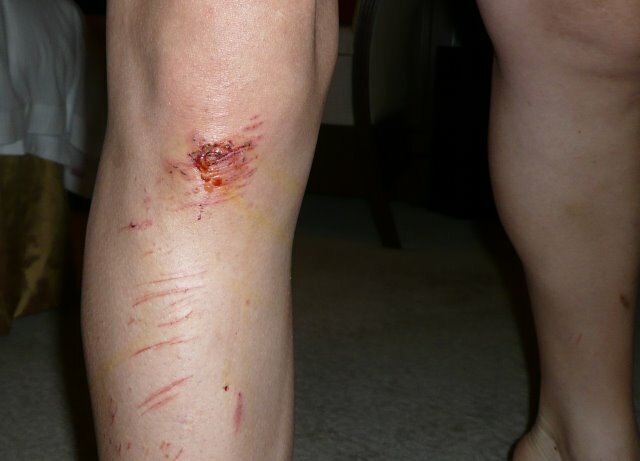 Desde el 4 al 4,8 mis piernas dijeron basta, totalmente llenas de acido láctico y calambres que me provocaron las escaleras de esta sección. Totalmente exhausto, sin poder correr y a veces sin poder pasar a corredores más lentos llegue al punto más alto, de unos 260 metros. La bajada no fue más fácil, escaleras, llanos, cortas subidas… Comencé una bajada suicida desde el 5 al 7.5 jugándome el tipo y pasando a gente por las cunetas. Tuve un par o más de avisos: te vas a romper un tobillo. Pero llegue a una sección de asfalto en el 6 donde pude recuperar algunas posiciones a un ritmo de 4:45 (reíros, reíros). Antes de llegar al avituallamiento y check point de la playa de Pui O tuvimos que cruzar una lengua de mar que me dejo empapados los pies y llenos de arena. Odio correr en la playa, de hecho nunca lo he hecho con lo que imite a los que si lo hacen y me puse en la zona donde la arena esta mojada. Cruce este punto en el top 10 o 15, según me dijo un amigo que estaba allí. El tiempo del ganador fue 48 minutos versus mis 52 en este punto. Sólo quedan 4 kilómetros, animo! Mierda, tengo que correr 700 metros por las rocas que están al final de la playa (bueno correr o andar), saltando de una a otra roca que además resbala de forma peligrosa. Con esto no contaba. El incidente, el miedo, mi poca aptitud para correr en cantos rodados hacen que la gente me pase y pierda mucho tiempo en esta sección. Llega el tramo del río, un kilómetro de despropósito cuesta arriba siguiendo el curso de un río lleno de rocas con verdín, que resbalaban más que pastillas de jabón, secciones que incluían subir ayudado de cuerdas e incluso una escalera del mismo material. Durante los primeros 700 metros avanzo bien y paso a gente pero mi rodilla no para de sangrar, estoy cansado, sobre todo los brazos y hombros y mi moral ya no esta en modo agresivo, si no en modo “llega entero a casa”. Menos mal que me compre los guantes porque has de usar las manos y los brazos constantemente. Unas 5 personas o quizás más me pasan en los último 300 metros, pero es que ya me daba igual. En otra sección de asfalto de unos 200 metros recupero posiciones y paso a dos de ellos corriendo por una carretera abierta al tráfico. Un descenso suicida más sin fuerzas para controlar un error y llego al último kilómetro y medio. No esta mal. Lo que no esperaba era otra vez la playa llena de cantos rodados y los acantilados, así que desmoralizado me pongo a andar otra vez. Demasiado cansado para pensar y para ver donde pongo los pies. No quiero más heridas. Termino la carrera exhausto pero sobre todo pienso que he fracasado mi misión, con una conejo hija que se ilusionó al verme tan arriba en el 8 y que asistió a mi hundimiento. Lo he hecho lo mejor que he podido, lo he dado casi todo, he sufrido casi más que nunca pero ni me esperaba esto ni me he entrenado para ello. Además conforme te haces viejo quieres más a tu pellejo que lo que crees. En fín, no me quede a la fiesta, no soy muy sociable y no estaba de mucho humor por lo que me fui a visita el Buda gigante de Lantau. While my running mates were preparing things for the 2009 cursa de bombers I was getting up to run my first trail race ever. I was quite confident in my possibilities because of our training spot and intensive hill running. The day before I spent more than three hours drawing the race path till the 8th kilometre and downloading a DEM (Digital Elevation Model) to figure up what the profile was. Now I am writing this review because I don’t want to forget about the experience. Even after the marathon my face was better and my gesture showed less suffering than today. Of course I have done several mistakes the first one was not to take some water or isotonic drink for the first eight km. 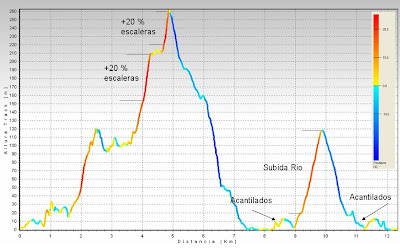 26 to 29 Celsius and 98 % humidity running in a tropical (or may sub tropical forest) is not what we found in our Parc Güel. Another one was starting the run at a moderate pace (3:40 minutes a kilometre) that put me in the middle of nowhere. I thought that people wanted to commit self suicide but there were fighting to arrive to the first kilometre mark the sooner as possible. And there was a good reason to do so. A narrow path, sometimes just enough for one person makes quite difficult to overpass. From approximately 1.6 to 2.5 the path was climbing up to the top but I was able to run at a modest but constant pace, but from the 4 to the 4.8 my legs were totally burnt out by the ladders that appeared in that section. Unable to run and blocked by some runners I got to the top (about 260 meters) totally exhausted. The descent was not better, with my legs aching and full of lactic acid I started a suicide downhill section from 5 to 7.5. Passing people out of the track and having some severe warning with some stones that were in the mood to break my ankles. Finally about the 6th we arrived to a “normal road” and I was able to maintain a pace of about 4:45 minutes a kilometre (enough to pass quite a few people). We have to cross some water to get into the Pui O beach and about 700 meters running on the beach (with my shoes full of water and sand, excellent). I hate running on the beach and I try to imitate the more experienced people, so I moved to the wet side and crossed the first check point in the top 10 or top 15 according to a friend who was there taking pictures. The winner made 48 minutes and I made an impressive 52. Not bad. There were only 4 kilometers left. Damn it!. Now we have about 700 meters of running / walking on the cliffs, jumping from one slippery rock to another one. This is something that I did not count on. The incident, my poor attitude to run over that rounded rocks beach made that most of the people who was behind passed me on that section. About four five people overtook me on the last 300 metres but a short road section of about 200 meter were enough to pass two of them. The same damn rounded rocks beach and cliff section. I decided to walk, I was too tired just to think and to look where my feet were landing and I wanted no more wounds. 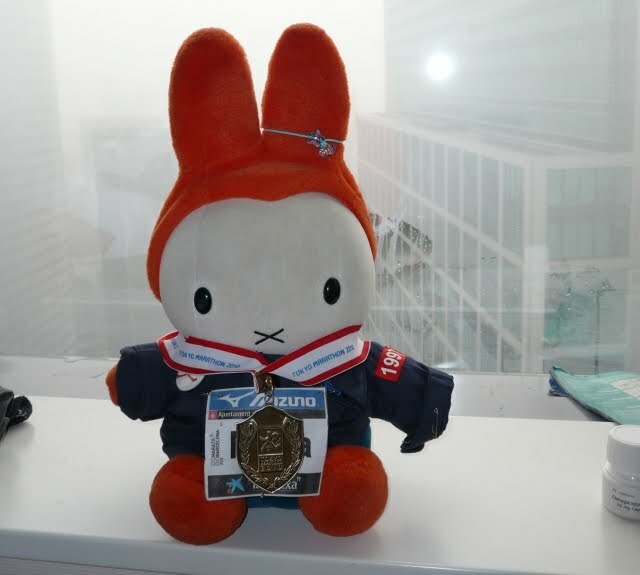 I finish the race exhausted but above all with the feeling that I have failed my mission, with an angry daughter bunny who saw me on the top positions on the 8th and that finally was deceived when I plunged on the ranking. I did my best, I was more tired than ever and I suffered quite a lot, but I did not expect that and, of course, I was not trained for that. I decided to catch a taxi and go to visit the Giant Buddha so I missed the finish party. Well I am not a very social person and besides I was quite sad. Well, I have the feeling that lately Father Bunny is obsessed with running, cycling and swimming. This is surely because of bad companions. 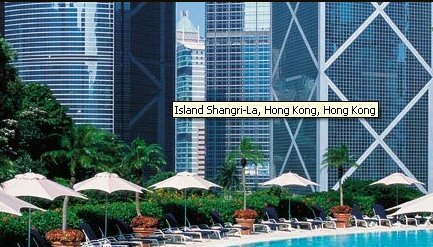 But for this time I will like to thank them because from the 28 meters long swimming pool my favourite building – The Bank of China– view is just fantastic. 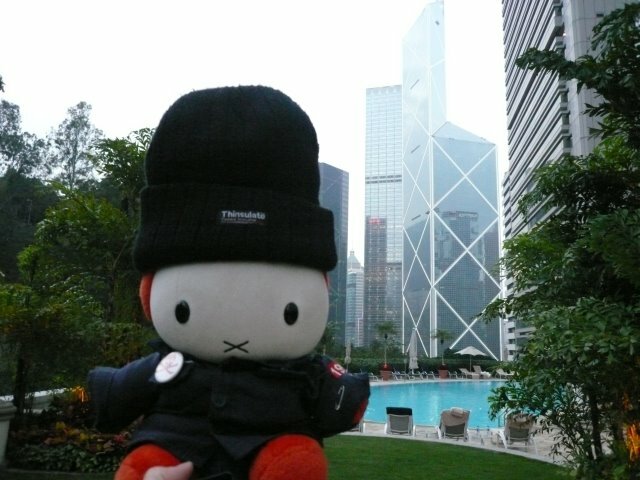 May be Father Bunny wants to thank the building for the good luck it gave to him in the Marathon (he printed the HK skyline in her bid and shoe sole). 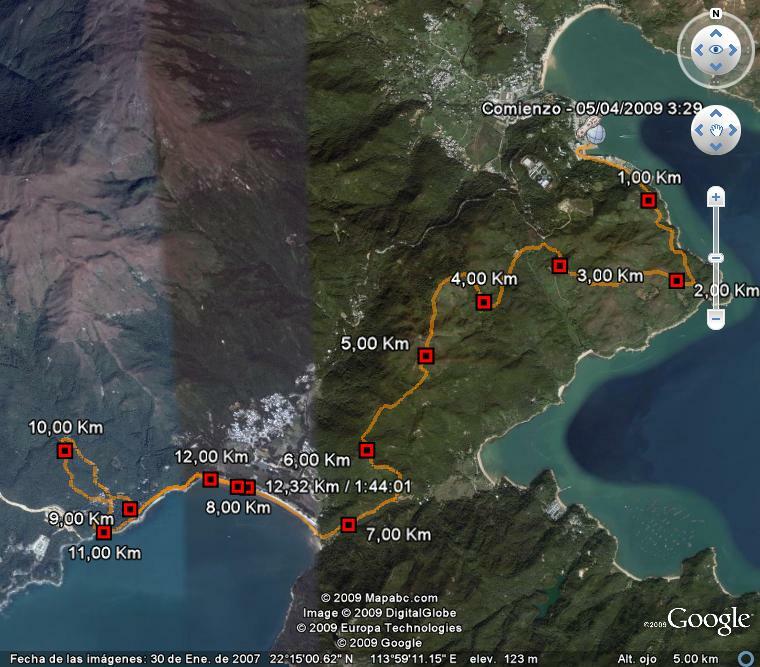 Tomorrow Volvo Bonaqua Mui Wo to Pui O sprint race.